See Bishop Leonard Blair's letter To Protect and to Heal. See the Dallas Morning News database entry on Bishop Emeritus James Hoffman. The June 2002 database examined the records of bishops and identified those who had allowed accused priests to continue working or had otherwise protected priests accused of sexual abuse. The database is relevant to the bishops' "Nature and Scope" study because the bishops who prepared the surveys for the study are in many cases responsible for the "scope" of the problem. One of the things the U.S. Bishops agreed to do when they met in Dallas in 2002 to discuss clergy sexual abuse, was to commission the John Jay School of Criminal Justice in New York to study the extent of sexual abuse of minors by the clergy. The John Jay team will issue a report Feb. 27 revealing the nationwide incidence of sexual abuse of minors by Catholic clergy from 1950 to June 2002, together with other data. Although the John Jay study ends with the year 2002, the statistics that follow for the Diocese of Toledo are from 1950 through Feb. 13, 2004. According to diocesan records, the total number of clerics (bishops, priests and deacons) serving in the Diocese of Toledo from 1950 through today is 1,753. 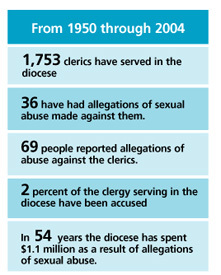 Of these 1,753 clerics, 36 have had allegations of child sexual abuse made against them. This represents 2 percent of the 1,753 clerics. The total number is broken down as follows: 28 diocesan priests; seven religious order priests and one permanent deacon. Of the 36 accused clerics, nine are deceased; one is under investigation; 23 priests and one deacon are barred from any ministry; and two were exonerated of the accusation. A total of 69 individuals made allegations against the 36 clerics. There have been a total of 19 lawsuits filed against the diocese alleging sexual abuse by clergy. During the course of the past 54 years, our best calculation is that the Diocese of Toledo spent $1,107,182 as a result of allegations of sexual abuse of minors. This amount was disbursed as follows: $232,917 in pastoral care and counseling; $180,750 in settlements and $693,515 in legal fees. The expenses incurred over time as a result of sexual abuse of minors have been paid from the Diocesan Insurance Fund. No money has been used for this purpose from any collections or appeals, such as the One Faith … Many Blessings Campaign or the Annual Catholic Appeal. February 13, 2004 – Toledo, Ohio-Bishop Leonard Blair, installed as Toledo’s seventh bishop less than three months ago, released information today on allegations of sexual abuse of minors by clergy in the Diocese of Toledo from 1950 through today. Under the diocesan initiative To Protect and To Heal, the bishop outlined the steps that the diocese has taken to create a “safe environment” as stipulated by the Charter for the Protection of Children & Young People and Essential Norms as adopted by the nation’s bishops in 2002. On February 27, aggregate statistics for the 195 U.S. dioceses will be released as part of a study by New York’s John Jay College of Criminal Justice, commissioned by the U.S. Conference of Catholic Bishops in 2002. The John Jay report will include the total number of sexual abuse allegations made against clergy, the number of victims claiming sexual abuse by clergy, and the total costs for the U.S. Catholic Church during the period 1950-2002. The Diocese of Toledo chose to release local statistics through February 13, 2004. According to diocesan records, 36 clerics (bishops, priests and deacons) representing 2% of the 1753 clerics serving in the Diocese of Toledo since1950 have had allegations of child sexual abuse made against them. Of the 36 clerics, 28 were diocesan priests; seven were religious order (non-diocesan) priests, and one was a permanent deacon. Of the 36 accused clerics, nine are deceased, one is under investigation, 23 priests and one deacon are barred from any ministry; and 2 priests were exonerated of the accusation. The diocese reported that a total of 69 individuals made allegations against the 36 clerics, and a total of 19 lawsuits have been filed against the diocese alleging sexual abuse by clergy. During the course of the past 54 years, the diocese reports that $1,107,182 has been spent as a result of allegations of sexual abuse of minors. The disbursement of this money was $232,917 in pastoral care and counseling, $180,750 in settlements and $693,515 in legal fees. All expenses incurred as a result of sexual abuse of minors have been paid from the diocese’s insurance funds. None of the money used for this purpose was from collections, appeals or fundraising campaigns, including the dioceses’ recent capital campaign and annual campaigns. More detailed information from To Protect and To Heal, including the bishop’s letter, a list of frequently asked questions about clergy sexual abuse and a summary of the statistics regarding cases of clergy sexual abuse of minors can be found in the February 13th issue of the Catholic Chronicle, and also on the diocese’s website www.toledodiocese.org. The diocese also supplied bulletin inserts to parishes that will be distributed February 21-22. The Diocese of Toledo, established April 15, 1910 encompasses 8222 square miles in a mixture of urban and rural areas that spans 19 counties across Northwest Ohio, serving 314,000 Catholics. The diocese includes Allen, Crawford, Defiance, Erie, Fulton, Hancock, Henry, Huron, Lucas, Ottawa, Paulding, Putnam, Richland, Sandusky, Seneca, Van Wert, Williams, Wood and Wyandot counties.